First Service Bank recently added Justin Zimmerman, Janet McPhate and Corey Throneberry to its staff in Conway. 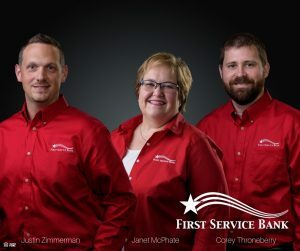 First Service Bank recently announced that Corey Throneberry and Justin Zimmerman have been hired as loan officers and business development and Janet McPhate as senior operation officer serving in Conway. With more than 20 years of banking experience, Justin is a native of St. Vincent (Conway County) and is a graduate of the University of Arkansas Community College at Morrilton, with a degree in banking and finance as well as many accreditations throughout the Arkansas Bankers Association. He currently serves on the UACCM Accounting Advisory Committee. Justin and his wife, Sara Ammann Zimmerman, have three daughters who keep them very busy with basketball, archery, beauty pageants and clogging competitions. They are members of First Baptist Church of Clinton. Corey is a lifelong resident of Conway and graduated from Conway High School and the University of Central Arkansas with a BBA in insurance and risk management. Corey lives in Wooster with his wife, Lauren, son Caden and daughter Kinley. He is a member of Summit Church of Conway and enjoys time with his family, being in the outdoors hunting and fishing and playing golf. Janet brings 28 years of banking experience to First Service Bank. She is a graduate of the University of Central Arkansas with an administrative services/office management degree. She is also certified by the Arkansas Institute of Banking. Janet and her husband have been married for 34 years and have two children. She loves camping, anything sports related and the Conway Wampus Cats. She and her husband are active members of First Baptist Church, Conway. “Our Conway team is proud to have Justin, Corey and Janet join us, and we feel strongly that their banking background will be an asset to our Conway team, and most importantly our customers,” said Tom Grumbles, CEO and president of First Service Bank. First Service Bank has locations in Greenbrier, Conway, Marshall, Mountain View, Dermott, Shirley, Yellville, Flippin, Clinton and Little Rock with its headquarters in Faulkner County. A majority family-owned and operated bank for 56 years, First Service employs 110 people at 10 locations around the state. “Like” First Service Bank on Facebook or follow the bank on Twitter at @1stServiceBank and @FirstServiceBnk.